1) (Hitcham, co. Buckingham, temp. Richard II.). Sa. a chev. betw. three rams’ heads couped ar. 2) (Marchwood, co. Hants). Ar. a fesse gu. 3) (co. Kent). Az. a chev. betw. three rams pass, or (another, the chev. ar.). 4) (Kenton Hall, co. Suffolk, temp. Henry V.). Gu. an escallop betw. three rams’ heads full-faced erased at the neck ar. Crest—A man’s hand and arm couped at the elbow, supporting a hawk. 5) (Eatonbridge, co. Kent, and London; William Ramsey, eldest son, and Sir Thomas Ramsey Knt., Sheriff of London 1568, and Lord Mayor 1577, sons of John Ramsey, Esq., of Eatonbridge. Visit. London, 1568). Sa. a chev. erm. betw. three rams’ heads erased ar. horned or. Crest—A griffin’s head erased per fess indented ar. and sa. the base guttée d’or. 6) Gu. three rams ar. 7) Az. a chev. betw. three rams or. 8) (co. Oxford). Gu. three rams’ heads ar. 9) Az. six plates (another, bezants) three, two, and one. 10) Gu. three rams’ heads couped ar. 11) Per bend or and gu. three birds counterchanged. 12) Sa. a chev. betw. three rams’ heads erased or. 13) (Fun. Ent. Ulster’s Office, Mr. Ramsey, killed 16 Feb. 1658). Or, an eagle displ. sa. 14) (Earl of Dalhousie). Ar. an eagle displ. sa. beaked and membered gu. Crest—A unicorn’s head couped ar. armed or. Supporters—Two griffins ppr. Motto—Ora et labora. The tenth earl, who was made Marquess of Dalhousie, and d. s. p., quartered Brown, of Colstown, [which see]: the succeeding earls, as Barons Panmure, have quartered, Per pale ar. and gu. a bordure charged with eight escallops counterchanged, for Maule; and bore an additional crest, A wyvern with two heads vomiting flames before and behind ppr. 15) (William Ramsay, younger son of the Earl of Dalhousie). As Dalhousie, within a bordure az. Crest—A griffin’s head ppr. Motto—Ora et labora. 16) (Edingtoun, co. Berwick). As Dalhousie, within a bordure gu. Crest—A unicorn’s head couped ppr. armed or, charged with a crescent ar. Motto—Dum varior idem. 17) (Earl of Holderness, extinct 1625; Sir John Ramsay, brother of George, first Lord Dalhousie, Viscount Haddington, in the peerage of Scotland, was raised to an English earldom, 1621, d. s.p.). Two coats per pale; 1st: Ar. an eagle displ. sa. beaked and membered gu. charged on the breast with a crescent of the field; 2nd, of augmentation granted in honour of his service to James VI. of Scotland, in the Earl of Gowrie’s conspiracy: Az. issuing out of the sinister part of the shield a dexter arm or, holding a sword erect ar. pommel and hilt gold, piercing a human heart gu. the point supporting an imperial crown ppr. Supporters—A unicorn and a stag, both collared. Motto—Haec dextra vindex principis et patriae. 18) (Cockpen, co. Edinburgh). As Dalhousie, within a bordure nebuly sa. Crest—A unicorn’s head couped ar. armed or, within two branches of laurel orleways vert. 19) (Whitehill, co. Edinburgh, bart., 1665). As Dalhousie, within a bordure sa. charged with eight roses ar. Crest—A unicorn’s head erased ar. charged with a rose gu. Motto—Semper victor. 20) (Wardlaw-Ramsay, Whitehill, 1849). Quarterly, 1st and 4th grand quarters, as the last; 2nd and 3rd grand quarters, counter-quartered, for Wardlaw, 1st and 4th, az. three mascles or, 2nd and 3rd, az. three water bougets or, with a crescent ar. in the centre of the grand quarter. Same Crest for Ramsay. Crest, for Wardlaw—A star of eix points wavy or. Mottoes—Over the two crests: Familias firmat pietas; below the shield: Semper victor. 21) (Abbotshall and Waughton, bart., 1669). Quarterly, 1st and 4th, ar. an eagle displ. sa. beaked and membered gu. a chief of the last, for Ramsay; 2nd and 3rd, counter-quartered, for Hepburn, of Waughton, 1st and 4th, gu. on a chev. ar. a rose betw. two lioncels counter-combatant of the field; 2nd and 3rd, ar. three martlets gu. Crest—A demi eagle displ. sa. Motto—Probando et approbando. 22) (Kinalty, 1793). Quarterly, 1st and 4th, ar. an eagle displ. sa. beaked and membered gu. in chief a mullet of the last, a bordure engr. vert; 2nd and 3rd, ar. a lion pass. guard. gu. imperially crowned and gorged with an open crown or, in base a crescent of the second, for Ogilvy. Crest—A unicorn’s head erased ar. gorged with an oak wreath fructed ppr. Motto—Fear nought. 23) (Balmain, paternally Burnett, bart., 1806). As the last, without Supporters. 24) (Provost of Methven, 1672). Ar. an eagle displ. sa. beaked and membered gu within an orle of eight mullets az. Crest—A star of six rays issuing out of a crescent ar. Motto—Superna sequor. 25) (Bamff, co. Perth, bart.). Ar. an eagle displ. sa. beaked and membered gu. charged on the breast with an escutcheon of the last. Crest—A unicorn’s head couped ar. maned and horned or. Motto—Spernit pericula virtus. 26) (France, 1680). Ar. an eagle displ. sa. beaked and membered gu. charged on the breast with a thistle or. Crest—An eagle rising reguard. sa. beaked and membered or. Motto—Migro et respicio. 27) (France, 1728). Ar. an eagle displ. sa. armed and membered gu. a bordure nebuly of the last. Crest—A unicorn’s head. Motto—Ora et labora. 28) (Allan Ramsay, the Scottish poet, 1740). Ar. an eagle displ. sa. beaked and membered gu. holding in his talons branches of laurel and olive disposed in saltire ppr. Crest—A unicorn’s head and neck ar. horned and maned or, collared gu. and charged with thistles ppr. Motto—Virtute me involvo. 29) (Brackmont). Ar. an eagle displ. sa. beaked and membered gu. bearing on the breast another eagle displ. of the field. Crest—A battering ram or, headed and viroled az. Motto—Perrumpo. 30) (Colluthie). Quarterly, 1st and 4th, ar. an eagle displ. sa. beaked and membered gu. ; 2nd and 3rd, az. a boar’s head erased ar. betw. three lozenges or, for Kinloch. 31) (Foxtown). Ar. an eagle displ. sa. beaked and membered gu. charged on the breast with a fleur-de-lis or. 32) (Pitcruvie). Ar. an eagle displ. sa. beaked and membered gu. debruised by a baton of the last. 33) (Denune). Ar. an eagle displ. sa. beaked and membered gu. surmounted by a hend of the last, charged with three crescents ar. 34) (Barnton, co. Edinburgh; now represented by Sir Alex Ramsay-Gibson-Maitland, Bart., as heir of line). Ar. an eagle displ. sa. within a bordure of the second bezantée, on a chief gu. three cinquefoils erm. Crest—A unicorn’s head couped ar. armed or. Motto—Ora et labora. 35) (Edinburgh, 1825). Ar. an eagle displ. sa. within a bordure of the second bezantée, on a chief gu. a mullet of the first betw. two cinquefoils erm. Crest—A horse’s head and neck couped sa. bridled ar. Motto—Avance. 36) (Edinburgh, 1825). Ar. an eagle displ. sa. within a bordure indented of the second bezantée, on a chief gu. a mullet of the first betw. two cinquefoils enn. in collar point a crescent counterchanged of the field. Crest and Motto, as the last. 37) (James Ramsay, Bishop of Dunblane, 1673). Ar. an eagle displ. betw. two serpents orleways sa. Crest—A dove within an adder disposed orleways. Motto—Prudentia decus innocentia. 38) (Barra, co. Aberdeen, 1858). Quarterly, 1st and 4th, ar. an eagle displ. sa. surmounted of a fesa of the field, charged with three stars of six points wavy az., for Ramsay; 2nd and 3rd, ar. three stars of six points wavy az. in middle chief a mullet gu. a bordure chequy of the second and first, for Innes. Crest—An eagle rising reguard. sa. armed and beaked or, for Ramsay; A branch of palm slipped ppr., for Innes. Mottoes—Migro et respicio; and, Ornatur radix fronde. 39) (Russel, co. Fife, 16th century). Quarterly, 1st and 4th, ar. an eagle displ. sa. beaked and membered gu. ; 2nd and 3rd, ar. a chev. gu. betw. three pewits sa., for Russel. 40) (Croughton House, Brackley, co. Northampton). Ar. an eagle displ. sa. beaked and membered. gu. Crest—A unicorn’s head couped ar. armed or. Motto—Semper victor. 41) Gu. three rams’ heads couped ar. Crest—A parrot vert, breast gu. in the mouth an annulet or. This family is said to have come from a market town in Huntingdonshire. The ancestor of this family was Symon (or Simon or Simund) de Ramesie, a nobleman who came from Normandy, France. It is a locational or habitational name denoting a person who came from a place in Huntingdonshire so called, deriving from the Old English word hrasmsa, meaning wild garlic and the word for island or low lying land. Hence, the theory is that this family came from an island where wild garlic grew. There are other places in England named Ramsey, but historians are confident the locale in Huntingdonshire is the source of this Scottish family. It was spelled Hramesege in the Saxon Chartulary. Another source also mentions some came from a town named Ramsey in the south west of Harwich and Essex, which was spelled as Rameseia in the Domesday Book of 1086 AD (a survey of England and Wales ordered by William the Conqueror) and as Rammesye in the Feet of Fines for Essex in 1224 AD. Henry Harrison’s 1912 book, Surnames of Scotland, states this is an English and Scandinavian name from the same etymology/location mentioned above, stating that in old Anglo-Saxon charters the town is spelled as Rameseg and Hrameseg. The same book also mentions it was anciently Ramsöe, with the o umlaut being a Dano-Norwegian letter signifying an island. Mark Anthony Lower states, in his nineteenth century book, that “The name is totally distinct from that of Ramsey. 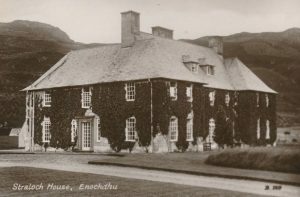 The The Earl of Dalhousie’s family are said to be of German extraction. They are traced from Simon de Ramsay of Dalhousie, in Lothian, temp. David I. 1140. The lands of Ramsay are in Argyleshire”. A one Aethelstanus de Rameseia was documented in the Old English Byname Register of 1036 AD. Some spelling variants or names with similar etymologies include Ramsay, Rumsey, Ramasey, Ramesey, Ramssey, Ramisey, Remesey, Ramsa, Ramissay, Ramhishay, or Rameseye, and about 100 others. The Latin is de Rameseia. The last name Ramsey ranks 373rd in popularity in the United Status as of the 2000 Census. The name ranks particularly high in the following three states: Tennessee, Oklahoma, and West Virginia. The surname Ramsey frequency/commonness ranks as follows in the British Isles: England (1,257th), Scotland (1,847th), Wales (1,51st), Ireland (3,096th) and Northern Ireland (412nd). In England, it ranks highest in counties Durham, Northumberland, and Suffolk. In Scotland, the surname ranks highest in Shetland. In Wales, it ranks highest in Pembrokeshire. In Ireland, it ranks highest in Donegal. In Northern Ireland, it ranks highest in county Antrim. The name is also present throughout the remainder English speaking world: Canada (2,547thh), New Zealand (2,296th ), Australia (1,614th), and South Africa (10,268th). The last name Ramsey ranks 4,347th in popularity in the United Status as of the 2000 Census. The name ranks particularly high in the following three states: and New Hampshire, Maine, and Florida. The surname Ramsey frequency/commonness ranks as follows in the British Isles: England (869th), Scotland (127th), Wales (1,163rd), Ireland (2,580th) and Northern Ireland (1,995th). In England, it ranks highest in counties Northumberland and Durham. In Scotland, the surname ranks highest in Angus. In Wales, it ranks highest in Merionethshire. In Ireland, it ranks highest in county Donegal. In Northern Ireland, it ranks highest in Londonderry. The name is also present throughout the remainder English speaking world: Canada (680th), New Zealand (414th), Australia (551st), and South Africa (1,571st). 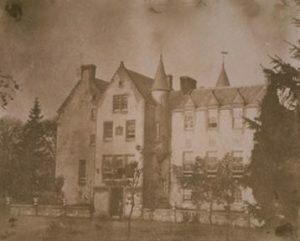 Brechin Castle c. 1880, current seat of Earl of Dalhousie, chief of Clan Ramsay. This is a Scottish Lowland clan. The clan’s plant badge is blue harebell. 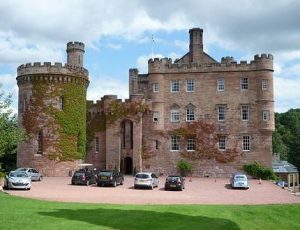 They are seated at Brechin Castle, Angus, Scotland currently, but where ancient seated at Dalhousie Castle. Their tartans are modern, red and hunting, blue. Branches include Ramsay of Balmain, Ramsay of Banff, and Ramsay of Dalhousie. Septs include Ramsey, Ramsay, Dalhousie, Maule, Brechin, and Brechen. Their Gaelic name is Ramsaidh. Their Latin motto is Ora et Labora, which means Pray and work. The following is a discussion of five different noble, royal, landed, or aristocratic families bearing this last name. The lineage of this branch of the family tree begins with the ancient family of Innes of Innermarke and Edengight. 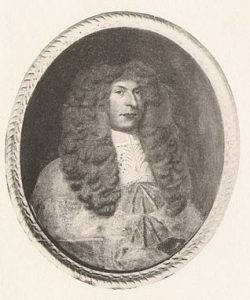 John Innes, son of James of Maisley and grandson of John of Edengight, in 1785, married Mary, daughter and heiress of John Ramsay of Barra, and upon the death of his father-in-law, assumed the surname of Ramsay. 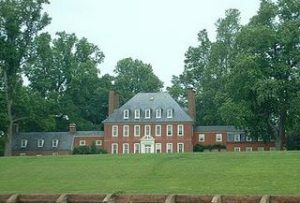 He had the following issue: John (his heir), James (married Maria Campbell of Troup), William (married and had two daughters), Mary (married William Brebner and later H.G. Leslie of Dunlugas), Elizabeth, Margaret (married General Sir George Turner), and Helen. His eldest son was John of Barra who was born in 1786. In 1831, he married Susan, daughter of Alexander Innes of Pitmedden, and had two children with her: John and Christina Susan Mary. He died in 1832. His son John Ramsay Esquire, of Barra, county Aberdeen, was a Justice of the Peace and Deputy Lieutenant, educated at Cambridge, born in 1831. He was also a Major of the Royal Aberdeenshire Highlanders and the Lieutenant Colonel of the Aberdeen Rifle Volunteers. In 1858, he married Leonara Sophia, daughter of Reverend Nathaniel Bond of Creech Grange, and had a daughter with her named Mary Agnes. The Ramsay Coat of Arms (mistakenly called the Ramsay Family Crest by those unfamiliar with heraldry and genealogy) is blazoned as follows: Quarterly: 1st and 4th, argent, an eagle displayed sable surmounted of a fess of the field, charged with three stars of six points wavy azure, for Ramsay; 2nd and 3rd, argent, three starts of six points, two and one, azure and in the centre chief a mullet gules, all within a bordure invected chequy of the second and first, for Innes. Crests: 1st, Ramsay: An eagle rising reguardant sable armed and beaked or, langued gules; 2nd, Innes: A branch of palm slipped proper. Mottoes: Migro et respicio; and, Ornatur radix fronde. The family was seated at Straloch, near Aberdeen, Scotland, in modern day United Kingom. 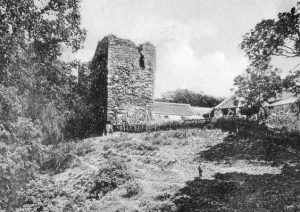 The Ramsay genealogy begins with the ancient House of Wardlaw, Baron of Torrie, who lost many lands for its support of the cause of King John Baliol, but still retaimed the estate of Torrie, in county Fife, Scotland. Sir Henry Wardlaw of Torrie had two sons: Andrew (his heir) and Walter (Bishop of Glasgow who became a Cardinal in 1381). His son Sir Andrew married a daughter of the noble House of De Valoniis, and had two sons with her: William (his heir) and Henry (Archbishop of St. Andrew’s). He died in 1440. From his son William descended a length line of Wardlaws of Torrie and of Pitreavie. A one Sir Henry Wardlaw of Pitreavie became a Baronet of Nova Scotia (Canada) in 1631 during the reign of King Charles I of England. His third son was named John. This John married Jean, daughter of James Melville of Hulhill, and had a son also named John. 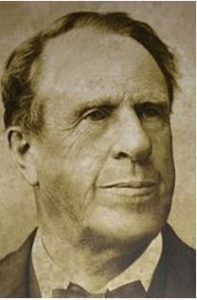 This son John was of Abden and he married Christian Dewar and had two sons with her: John (married Katherine Pringle, had a son named Christian) and William. William married Janet Marshall, and had issue with her. One of his sons was Captain William Wardlaw of the Royal Navy who married Elizabeth, daughter of Robert Balfour Ramsey of Balbirnie and Whitehill) and had the following issue with her: William (died in 1812 without posterity), Robert (discussed below), John (a general officer who married Anne, daughter of Gerard, 1st Lord Lake, had issue), and Anne (died 1849). 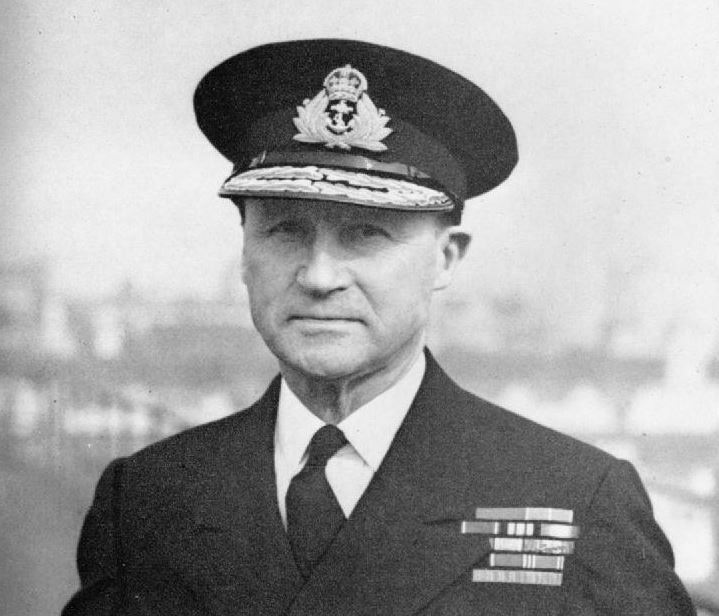 His second son, Robert Wardlaw Ramsay, was an Esquire and Captain H.E.I.C’s. Naval Service, who was the successor to the Whitehill estate at the decease of his maternal uncle. 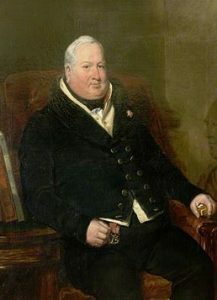 In 1811, he married Lady Anne Lindsay, 2nd daughter of Alexander, 6th Earl of Balcarres, and prior to his 1837 death, had the following four children: William, Robert Balfour (see below), Balcarres Dalrymple (Lieutenant Colonel in the army, married Anne Collins of Frowlesworth), and John (married Penelope Macdonall of Lison in 1847). His son Robert Balfour Wardlaw-Ramsay was an Esquire of Whitehill in county Edinburgh, Scotland and Tillcounty, county Clackmannan, Scotland, as well as a Justice of the Peace and Deputy Lieutenant who was born in 1815. 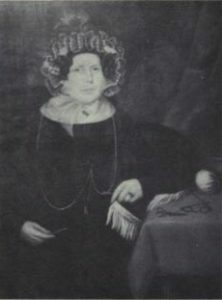 In 1841, he married Lady Louisa Jane Hay, daughter of George, 7th Marquess of Tweeddale and Susan Montague, and had ten children with her: Robert George (Lieutenant of the 67th Regiment), Susan Georgiana (married Reverend Frederick Abel Leslie Melville), Anne Charlotte, Louisa Jane, Elizabeth Caroline, Flora Catherine, May Alice, Edith Mary, Mabel Frances, and Emily Alexina. The Ramsay coat of arms has the following heraldic blazon: Quarterly: 1st and 4th, argent, an eagle displayed sable, beaked and member gules within a bordure sable charged with eight roses argent, for Ramsay; 2nd and 3rd, azure three mascles or, quartering Valence, for Wardlaw. Crest: 1st: A unicorn’s head erased argent charged with a rose gules: 2nd: An estoile or. Mottoes: Sempter victor; and, over the crests, Familias firmat pietas. The family seat was at Whitehall in Edinburg and Tillcoultry in Clackmannan, Scotland, in Great Britain and modern day United Kingdom of the British Isles of Europe. John Ramsey was an Esquire of Kildalton, county Argyll, Scotland, Justice of the Peace, Deputy Lieutenant, and Member of Parliament (for Falkirk) in 1874 who was born in 1814. 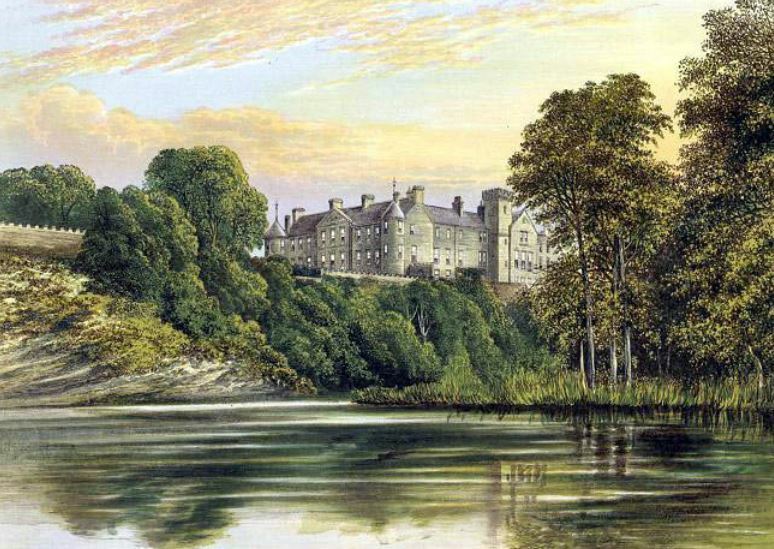 In 1814, he first married Elizabeth, daughter of William Shields of Lanchester county Durham, and secondly Lucy, daughter of George Martin of Auchendennan, and had two daughters: Mary Anne and Elizabeth Lucy He was the son of Robert Ramsay of Stirling and Elizbaeth Stirling of Craigforth. The family seat was Kildalton, Greenock, Scotland. The lineage of this family maternally descends from Sir John Ramsay, Knight of Balmain and Fasque, county Kincardine, who was created by King James III a Lord of Parliament in 1433. However, in 1488, he was outlawed and his estates subjected to confiscation during the time of James IV. Under the simple name of John Ramsay, he obtained at the same time, some lands in counties Forfar and Wigtoun, which favours were followed by a charter 1510, of the Barony of Balmain. He married Isabel, widow of Thomas Cant of Dumbarton, and had issue with her. One of his descendants was David Ramsay, of Balmain in county Kincardine, who was a Member of Parliament from 1612-1630. He married Margaret, daughter of Sir Gilbert Ogilvie, and had a son and heir with her named Gilbert. This Gilbert Ramsay, 1st Baronet, of Balmain, was a Member of Parliament for Kincardine from 1639-41 , 1645-6, and 1661-3 who was created Baronet of Nova Scotia in 1625. He married Grizel, daughter of James Durham of Pitkerrow, and had an only son with her named David. This son, Sir David Ramsay, 2nd Baronet, was a Member of Kincardine who first married Margaret, daughter of Sir James Carnegie of Balnamoon, having a son with her named Sir Charles (3rd Baronet). He died in 1673 and was succeeded by his son Charles. 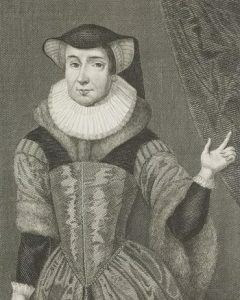 Sir Charles Ramsay married (secondly) Elizabeth, daughter of Sir Alexander Falconer of Gienfarquhar, and died in 1695, having had three sons with her. His eldest son, Sir David Ramsay, 4th Baronet, was a Member of Parliament for Kincardine in the early eighteenth century. He died in 1710 without posterity whereupon he was succeeded by his brother, Alexander. This Sir Alexander Ramsay, 5th Baronet, was a Member of Parliament for Kincardine from 1710-1713. He died in 1754 and was succeeded by his nephew, also named Alexander. This Sir Alexander Ramsay-Irvine, 6th Baronet, who was a Member of Parliament for Kincardine from 1765-1768, and who assumed the additional name of Irvine. He was the son of Charles. His mother was Catherine, daughter of James Mill, Provost of Montrose. He died in 1806, when the baronetcy became extinct or dormant. He passed his estates to his nephew, Sir Alexander Burnett Ramsay, 1st Baronet, who was born in 1757, the son of Sir Thomas Burnett of Leys and Catherine Ramsay. He assumed the name and arms of Ramsay. He was created a Baronet in May of 1806. In 1782, he married Elizabeth, daughter and co-heir of Sir Alexander Bannerman, and had five daughters and the following sons with her: Sir Alexander (2nd Baronet), Thomas (Captain of the 47th Foot, married Jane Cruikshank, had issue named William Burnett-Ramsay of Banchory Lodge, Elizabeth Marjorie, Catherine Forbes, Jane, and Thomas), Robert (Captain of the 14th Regiment of Foot, married Margaret Cruikshank of Stracathro, had a daughter, and sons named Robert of Howletts), Reverend Edward Bannerman (Dean of Edinburgh, married Isabella Cochrane of Halifax), Marmaduke (Fell and Tutor of Jesus College Cambridge), Sir William (Rear Admiral, born 1793), Edwin Hewgill, Elizabeth (married Alexander Renny Tailyour of Borrowfield), and Lauderdale (married David Duncan of Rosemont and later Sir James Horn Burnett of Leys). He died in 1810 and was succeeded by his son Alexander. Sir Alexander Ramsay, 2nd Baronet, was a Member of Parliament for Kincardine who was born in 1785. 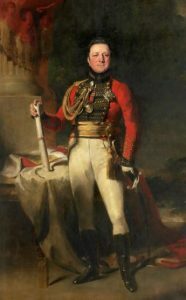 In 1811, he first married Jane, daughter and co-heir of Francis Russell of Blackhall, and had the following issue with her: Sir Alexander (3rd Baronet), William (born 1814), Francis (Captain of the Royal Army, married Geogina Hay Home of Wedderburn, had a daughter, and sons named Brigadier General William Alexander and Captain Francis Farquharson), Mary (married Reverend Bruges Lambert of Misterton and later John Sparkes of Crewkerne), and Elizabeth (married John Carr of Dunstan Hill and later Charles Murray Barstow). Sir Alexander secondly married Elizabeth, daughter of William, Lord Panmure, in 1822. They had the following children together: Fax Maule (Captain of the 56th Regiment), Edward Bannerman (Major-General Madras), Sir George Dalhousie (married Eleanor Julia Charteris, married daughter of John Crawford, had son named Alexander Panmure Osawals and daughter named Elizabeth Edith), Marmaduke (Colonel of Benegal S.C. who married Anna Maria Innes, had issue named Marmaduke, Fox Maule, and Alexander Charles Marquis), Patricia (married Captain John de Courcy Agnew of the Royal Navy), Christina (married Colonel Charles Elliot, son of James of Wolfelee), and Georgina Harvey (married Lieutenant General Sir Robert John Hay in 1861, had issue). He died in 1852 and was succeeded by his son, Sir Alexander. This Sir Alexander Ramsay, 3rd Baronet, was a Member of Parliament for Rochdale who was born in 1813. 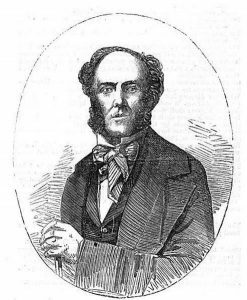 In 1835, he married Ellen Matilda, daughter of John Smith Entwisle of Foxholes, and had the following issue with her: Sir Alexander Entwisle (4th Baronet), Hugh Francis (married Jane Maria, daughter of General Frederick Harvey Sandys, had issue named Hugh Entwisle, and others), Captain John (Justice of the Peace of Hants, married Florence Mary Hilton of Preston House, had issue named Hilton Alexander, Lieutenant Norman, Major John Richard, Ethel, Hilda), Bertin (married Kate Graveraet Webster of Green Bay, Wisconsin, had issue named Hallie Ellen, Ethel Katherine), and Ellen Augusta (married Ernest de S. Hamilton Browne of Caynham in 1885). He died in 1875 and was succeeded by his eldest son, Alexander. This son, Sir Alexander Entwisle Ramsay, 4th Baronet, was a Deputy Lieutenant and Justice of the Peace, who was born in 1837. 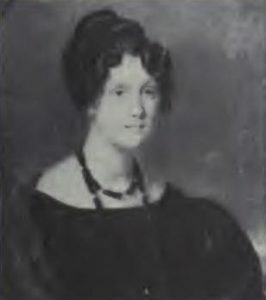 In 1837, he married Octavia, youngest daughter of Thomas Haigh of Elm Hall, and had the following children: Alexander Haigh (1866), Sir Herbert (5th Baronet), Arthur (married Marion, daughter of Van Dyke Hoskinson of Central America), Ellen Georgina (married Major Arthur Patrick Bateman Champain), Nora Mabel (of New South Wales, Australia), and Florence Augusta (married, in 1919, John Bertie Norreys Entwisle of Kilworth House, Rugby). 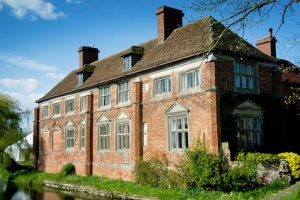 He secondly married, in 1880, Carolina Charlotte, daughter of Thomas James Ireland of Owsden Hall) and had a son with her named Gilbert Ireland (2nd Lieutenant of the R.G.A, born 1881). Sir Alexander died in 1902 and was succeeded by his eldest surviving son. 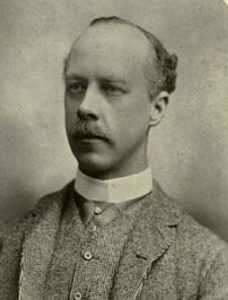 This son, Sir Herbert Ramsay, 5th Baronet, was born in 1868 and in 1902, married Mbael, daughter of William Joseph Hutchinson of Aldingham, Australia, and had two sons and two daughters with her as follows: Sir Alexander Burnett (6th Baronet, discussed below)), Herbert William Alexander (of Queensland, Australia, married, in 1936, Bessie Billingsby of Syndey, had issue named William Macalister in 1939, Elizabeth Barton in 1945, and Roslyn Nora in 1946), Nora Marjorie (married, in 1928, Colonel Adrian Bazley Barltrop of the 3rd Queen Alexandra’s Own Gurkha Rigles, had issue), and Constances Agnes (married, in 1939, Arthur Thomas Baldwin, son of Arthur, had issue). He was died and was succeeded by his son Alexander in 1924. Sir Alexander Burnett Ramsay, 6th Baronet, of Balmain, was born in 1903.In 1935, he married Isabel Ellice, daughter of Arthur William Whitney of Waugole, Woodstock, New South Wales, Australia, and had one son and two daughters with her as follows: Alexander William Burnett (1938), Enid Ellice (1937), and Patricia Thirza (1940). The Ramsay Coat of Arms (errononeously called the Ramsay Family Crest by those familiar with heraldry and genealogy) has the following heraldic blazon: Argent, an eagle displayed sable, and charged on the breast with a rose of the field. Crest: A demi-eagle displayed sable. Motto: Aspiro. They resided at Haddon Rig, Warren, New South Wales, Australia. The lineage of this branch of the Ramsay family tree begins with Neis de Ramsay, the head physician to King Alexander II of Scotland, when the family owned lands, received from that monarch, in Bamff, county Perth and the adjacent areas in 1232 AD. His son and heir was Malcolm de Ramsay, who was documented in the prior of St. Andrew’s in 1284. He in turn had a son named Adam de Ramsay, a Scottish Baron who submitted to King Edward I of England in 1296 AD. He in turn had a son named Malcolm. This Malcolm in turn had a son named Adam. This Adam in turn had a son named Neil de Ramsay, of Bamff, who had a resignation from Mariote, widow of John Lutsale, of the third part of lands of Easter Malias. He was succeeded by his son Gilbert. Gilbert was one of an assize of 17 men upon a division of the lands of Aberlemnock, before Walter Ogilvie, Sheriff of Angus, in 1388 AD. He died toward the end of the reign of King Robert III of Scotland. He had a son named Thomas Ramsay, of Bamff, who had a land charter from Robert, Duke of Albany, in 1420. He in turn had a son named Finlay Ramsay of Bamff. He in turn had a son named Alexander. Alexander lived a long life and died in 1507. He had a son named Gilbert. In 1482, Gilbert married Margaret, daughter of James, 1st Lord Ogilvie, and he had a son named Neis. This Neis Ramsay was the Sheriff of Perth. He in turn had a son named Alexander. This Alexander of Bamff married Elizabeth, daughter of Crichton of Ruthven, and had a son with her named George. This George Ramsay of Bamff married Elizabeth Wood of Bonnytoun, and died in 1580. He had a son also named George. This son George married Elizabeth, daughter of Mercer of Aidie, and had two sons with her: Gilbert and Alexander (physician to King James I and Charles I of England). He died in 1620 and was succeeded by his eldest son, Gilbert. This Gilbert married Isabel, daughter of Ogilby of Viova, and had a son with her named Gilbert. This son, Sir Gilbert Ramsay, 1st Baronet, was Knighted in 1635. He was created a Baronet of Nova Scotia in 1666 for the bravery of his son James at the Battle of Pentland Hills. He married Elizabeth, daughter of Sir Thomas Blair, of Baithayock, with whom he had the following issue: Elizabeth (married George Drummond of Blair), Thomas (married Jean Lumsdain of Innergwelly, had daughter), and James. The son, Sir James Ramsay, 2nd Baronet, married Christian, daughter of Sir Thomas Ogilby, with whom he had issue: John (3rd Baronet), George (chief physician to the English at Madras), and Sophia. He died in 1731 and was succeeded by his eldest son, Sir John Ramsay, 3rd Baronet, who married Lilias, daughter of Thomas Graeme of Balgowan. He was succeeded by his son in 1738. This son was Sir James Ramsay, 4th Baronet, who marries Elizabeth, daughter of George Rait of Anniston, and had four issue with her as follows: Sir John (5th Baronet), Sir George (6th Baronet), Sir William (7th Baronet), and Thomas (married Margaret, daughter of James Maxtone, had children). He died in 1782 and was succeeded by his son John. John, 5th Baronet, was the Sheriff of county Kincardine, Scotland. He died in 1783 and was succeeded by his brother, Sir George Ramsay, 6th Baronet. In 1786, Sir George married Eleanor, daughter of George, 14th Lord Saitoun. He died in a duel with Captain Macrae in 1790, whereupon he was succeeded by his brother William. Sir William, 7th Baronet, in 1796, married Agnata Francs, daughter of Vincent Biscoe of Hoodwood, and had three issue with her as follows: James (8th Baronet), George (9th Baronet), and William (a Professor of Humanity at the University of Glasgow, in 1834, married Catherine Davidson, had a daughter named Catherine Lilias Harrley who married Lieutenant Colonel James Wedderburn-Oglivy). He died in in 1807 and was succeeded by his eldest son James. This son, Sir James Ramsay, 8th Baronet, was born in 1797. In 1828, he married Jane, son and heiress of John Hope Oliphant. He died in 1859 and was succeeded by his brother George. Sir George, 9th Baronet, was born in 1800, and in 1830, married Emily Eugenia, daughter of Captain Henry Lennon, 49th Regiment, and had the following three children with her: James Henry (10th Baronet), William (of Bombay C.S., in 1867, married Harriot Wollaston, daughter of Major General Jullus B. Denys, had two sons named George and Arthur Dennys Gilbert), and George Gilbert (M.A. of Trinity College Oxford, in 1865, married Gertrude Schuyier Graham of Brooksbys, Lards, children named William Alexander, Sir Malcolm Graham, Reverend Gilbert Biscoe, Robert Eugene, and Gertrude Margaret Noel). 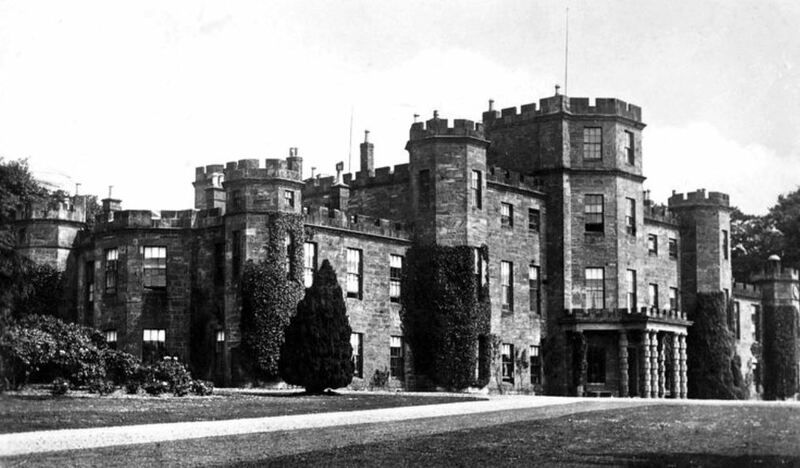 Sir George passed away in 1871 whereupon he was succeeded by his eldest son, Sir James Henry Ramsay, 10th Baronet. Sir James was a Deputy Lieutenant and Barrister-at-law who was born in 1832. He first married Elizabeth Mary Charlotte, daughter of William Scott Kerr of Chatto, and had three daughters with her as follows: Emily Mary, Chariotte Lilias, and Agnata Frances (married Reverend Henry Montagu Butler). In 1873, he second married Charlotte Fanning, daughter of Major William Stewart, of Ardvorlich, and had six children with her as follows: Nifel Neils (Lieutenant of the Black Warch, killed in action in South Africa at Magersfontein), Sir James Douglas (11tth Baronet), Katherine Marjory (born 1874, in 1899, married 8th Duke of Atholl), Ferellth (Justice of the Peace, in 1910, married Colonel Paul Robert Birn-Clerk-Rattray), and Aima Imogen Mary (in 1916, married Sir Sidney A. Armitage-Smith, and had issue). Sir James Douglas Ramsay, 11th Baronet, was born in 1878 and succeeded his father in 1925. He served in World War I and was educated at Harrow and Trinity College Cambridge. He was a Colonel on the 51 L.A.A Regiment of the Royal Army and a Major in the Scottish Horse Yeomanry. In 1908, he married Hope Anita Jane, daughter of Lieutenant-Colonel Alexander Donald MacGregor of the 92nd Highlanders, and had two sons with her as follows: Neis Alexander (educated at Winchester, served in World War II as Lieutenant of South Africa Engineering Corps, married Edith Alix Ross of Khyber Lodge) and David James, M.C. (Captain and Major of the Scottish Horse in the Royal Army who served in World War II, in 1939, married Anne Sisson, killed in Normandy in June 1944). The Ramsay Coat of Arms has the following heraldic blazon: Argent, an eagle displayed sable, beaked and membered, gules, and charged on the breast with an escutcheon of the first. Crest: An unicorn’s head, couped, argent, maned and horned or. Supporters: Two griffins proper. Motto: Spernit pericula virtus. They were seated at Bamff, Alyth, county Perth, Scotland, in modern day Great Britain or the United Kingdom. Anders Johan Ramsay (born in 1744). He married Johanna Petersen and fathered the following children with her: Adam, Johan, Carl August, Aurora, Gusatav, Anders Edvard, Sofia, Jacob, and Maria. 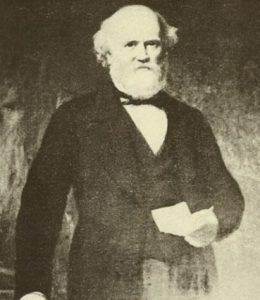 His son Carl August was born in 1791. He married Beara Peterson and had the following issue with her: Charlotta, Alexander, Wolter, Johan, Isabella, and Anders. His son Wolter Alexander Ramsay was born in 1825 and he married Emmy Beata Tham, having the following issue with her: Sofia, Charlotte, Wolter, Emmy, August, Gustav, Eva, Wilhelm, Henrik, Elsa, and Carl. His son Wilhelm Ramsay was born in Dalsbruk, Finland in 1865. He married Karin Helena Von Born and had numerous children with her as follows prior to his 1928 death in Helsinki: Helena Hulda Fransiska, Hulda Emmy Beata (Sumelius), Viktor Henrik Volter, Elsa Hulda Katarina (Dielh), Nene Hulda Barbara Frank, and Wilhelm August Wolter. His son Viktor Henrik Volter Ramsay was born in Perna, Finland in 1904. He married Virma Meri Ignatius and had issue with her prior to his 1977 passing, including a son named Mac. Mac was born in the 1940s. A one Sir Robert Ramsay was born in Aucherhouse, Angus, Scotland in 1267, He had a daughter named Marjory (Ogilvy) and Malcolm. His son Malcolm was born in 1325 and was the Sheriff of Forfar. He had a daughter named Isabel who was born in 1350 and later married Walter Ogilvy in 1830, having issue with him named Walter, Alexander, George, and John. 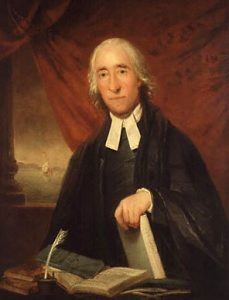 James Ramsey was born in 1720. He was a Loyalist from the Cherry Valley, New York. He served in the Butler’s Rangers and settled in Detroit, but later moved to Niagara Falls. He was granted land in Stamford Townshop and Niagara Township in Canada. He had issue, including a daughter named Martha, born in New York in 1746, who married John Burch, having a son with her named John Burch Jr. who was born in Canada in 1784. A one Thomas Ramsay was born in Chester, New Hampshire in 1748. He died in 1837 in Rumney, NH. Joseph Ramsey, age 30, came to Virginia aboard the Globe in August 1635. Robert Ramsey, age 15, came to Bermuda aboard the Dorst in September 1635. Robert Ramsey was buried in St. Michael’s parish, Barbados in April 1678. Other early settlers in colonial America bearing this surname include Penelope Ramsey (Virginia 1636), Morgan Ramsey (Maryland 1653), Bar Ramsey (Virginia 1653), James Ramsey (Virginia 1654), John James (Virginia 1654), John Ramsay (Maryland 1716), John Ramsay (Virginia 1751), and John Ramsey (Virginia 1705). In Canada, one of the first settlers bearing this last name was Elenor Ramsey, who at the age of 26, came to Saint John, New Brunswick aboard the Madawaska in 1833. The next year in 1834, a family bearing this name came to the same town aboard the Ambassador, including Robert and Jane Ramsey, husband and wife, age 23 and 20, respectively, farmers by trade, along with their two children William and Isabella. A one Ann Ramsay came to Nova Scotia in 1750. In Australia, Harriet Ramsey came to Adelaide aboard the Aden in 1849 and George Frederick Ramsey came in the same year aboard the Elizabeth. A one Ann Ramsay came to Adelaide aboard the Lord Goderich in 1838 and William Ramsay came there as well in 1839 aboard the Indus. In New Zealand, John Ramsey came to the city of Wellington in the year 1858, coming aboard the Oliver Lang. Charles A. Ramsay came to Auckland aboard the Bombay in 1863. In the same year, Andrew Ramsay came to Auckland aboard the Nimroud. 1) Argent an eagle displayed sable, beaked and membered gules. Crest: a unicorn’s head couped argent, armed or Wax seal on the will of Dr. George Ramsay in clerk’s office at Norfolk, Va. Will dated 22 June, 1756. 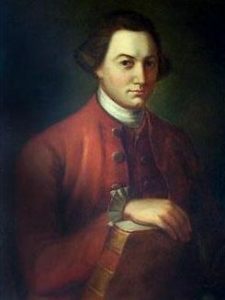 1) Captain James Ramsey of Baltimore, Maryland, 1735, who descended from Sir James de Ramsey of Dalhousie, Scotland. Arms: Argent, an eagle displayed sable, beaked and membered gules. Crest: A unicorn’s head couped argent, armed or. Motto: Ora et labora. 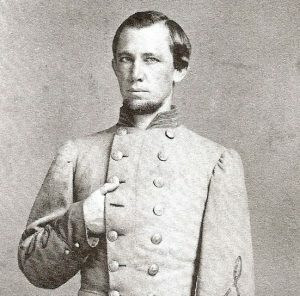 2) William McCreery Ramsey, Esquire of Westover, who bore the same arms as Captain James. 3) Mrs. Clarise Sears Ramsey of Westover, who descended from Edward III through Kathrine, daughter of John Howard, Duke of Norfolk, bore the arms of Richard Sears of Plymouth, Massachusetts (ie. Gules, a chevron argent between three eaglets proper. On a chief ermine, an escallop, between two mullets of the first). *This is an allusion to the crest of the family arms: An eagle reguardant (looking behind itself). There are hundreds of notable people with the Ramsey surname. This page will mention a handful. 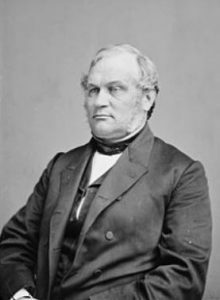 Famous people with this last name include: 1) Alexander Ramsey (1815-1903) who was the 34th United States Secretary of War during the Hayes and Garfield Administrations, 2nd Governor of Minnesota from 1860-1863, and a United States Senator from Minnesota from 1863-1875 who was born in Hummlestown, Pennsylvania, 2) Ben Ramsey (1903-1985) who was the 34th Lieutenant Governor of Texas from 1951-1961 and the 59th Texas Secretary of State from 1949-1950 who was born in the city of St. Augustine in said state, 3) David L. Ramsey III (1960) who was an American businessman, radio host, and author on personal finance who was born in Antioch, Tennessee, 4) Admiral DeWitt Clinton Ramsey (1888-1961) who was a U.S. Naval Office and aviator who served in World War I and II, born in Fort Whipple, Arizona, 5) Lieutenant Colonel Edwin Price Ramsey (1917-2013) who was an officer in the US Army who was a guerilla leader during the Japanese occupation of the Philippines during World War II, having been the last person to lead a cavalry charge in American military history, born in Carlyle, Illinois, 6) Frank Plumpton Ramsey (1903-1930) who was a British mathematician, philosopher, and economist from Cambridge, England, 7) Paul Ramsey who was a member of the British Columbia Legislative Assembly in Prince George North, Canada and a member of the New Democratic Party, 8) Norman Foster Ramsey Jr. (1915-2011) who was an American physicist born in Washington, DC who won a Nobel Prize in 1989 who invented the separated oscillatory field method and held various positions in governmental and international organizations such as NATO, 9) Robert Ramsey (1780-1849) who was a member of the US House of Representatives from Pennsylvania from 1833-1835, 10) Allan Ramsay (1686-1758) who was a Scottish poet and playwright born in Leadhills, Lanarkshire, and 11) James Ramsay MacDonald (1866-1937) who was the Prime Minister of the United Kingdom from 1929-1935 during the Monarchy of King George V, born in Lossiemouth, Morayshire, Scotland. and eagle, each which has its own unique meaning. Both the Ram and the ram’s head appear in heraldry, depicted in a lifelike aspect. Wade assigns it the meaning of “leader” on account of its role within the flock. Wade quotes Nichols in suggesting that it most resembles the primrose, which “brings good luck to the finder”. In Celtic mythology and folklore, this animal represents rebirth and fecundity. It was also revered by the Egyptians and Persians as a symbol of life, stability, and dominion. The symbol also has ties to the Holy Bible in the Christian religion, as the prophet Isaiah predicted this animal would return to the promised land with the Israelis and would offer themselves on the altar of the Millennial Temple, and Abraham also found a trapped Ram on Mount Moriah where he went to almost sacrifice his son Isaac to God in the book of Genesis. Where the lion is undisputed king of the animals, the eagle undoubtedly plays the same role in the realm of the birds, its use in this form dating back to at least the Roman period. They tend to be illustrated in quite some detail, especially in continental European arms, and have almost as wide variety of postures and accessories as the lion, well illustrated in the reference as well as being just the eagle’s head or eagle’s leg. The symbology of the eagle is deep and complex, Wade devotes several pages to the subject, but suffice it say that it has long been associated with Empire and those held in high honour – any armiger would be pleased to have any form of Eagle upon their arms! The eagle often symbolized the nobility, and conveyed various qualities such as power, sovereignty, magnanimity and fortitude of mind. It was a symbol not only of the Romans and Babylon, but was also the symbol of the Byzantine and Holy Roman emperors who succeeded Rome. Early members of the Christian church also utilized the eagle as a symbol of hope, strength, and the resurrection.